In the latest edition of MCN, road tester Trevor Franklin takes Ducati's MotoGP replica Desmosedici RR to an airfield and answers the question everybody wants to know. How fast will it go? Ducati claim that the Desmosedici produces 200bhp and can reach 200mph without breaking a sweat. 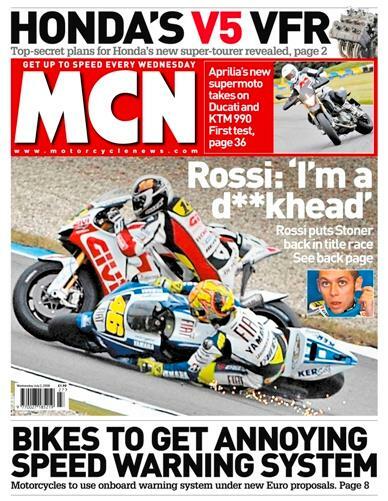 But to see how close the Desmosedici RR came to these figures you'll have to buy this weeks MCN. Also in this weeks Motorcycle News, we reveal Honda's plans for their 2009 V5-engined VFR800 sports tourer motorbike. 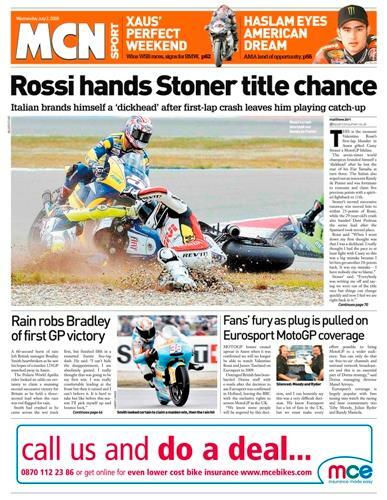 Valentino Rossi brandishes himself a 'd**khead'.